Hercule Poirot is not dead. Agatha Christie may have passed away thirty-eight years ago, but her creation lives on through author Sophie Hannah (with permission from Christie’s family). 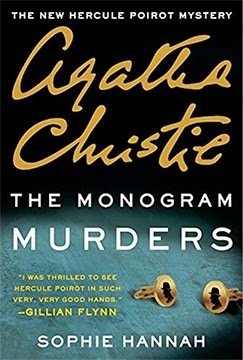 However, if you are looking for another Poirot book in the style of Agatha Christie, you can fuhgeddabowdit. Part of what drove me away from Agatha Christie’s books many, many years ago — and eventually drove me back into her literary arms soon after — was how two-dimensional her stories and characters were. Now I find that two-dimensionality comforting. In Christie’s books, there is much “wickedness” and very little ambiguity. Sophie Hannah has added a layer of psychological depth. Instead of wickedness, there is a blanketing darkness. Écoutez. Poirot is temporarily trying to escape the burden of being Hercule Poirot, retired Belgian detective and current thorn-in-the-side/consultant to Scotland Yard. He has left the comfort of his perfectly aligned home for the suffocating coziness of a boarding house not far from his digs. Of course there is a police detective also in residence, Edward Catchpool, with whom Poirot investigates three (almost) identical murders at a hotel. Catchpool is no Hastings when it comes to chronicling the activity in Poirot’s “little grey cells.” That is both good and bad. Catchpool and Hastings are equally clueless, both having rather simple approaches to solving a murder, but Catchpool comes with his own mental baggage, which strangely interferes with his duty as a detective of homicides. Christie was lean and tight in her storytelling; Hannah tends, through Catchpool, towards more details and frills. Whether Hannah will captivate enough readers to continue wearing Christie’s mantle remains to be seen. In the positive column, I could clearly hear David Suchet’s voice whenever Poirot spoke. In the less successful column — if she is trying to emulate Christie — her story lacks the humor and tartness of the original. All in all, by today’s standards, her story has the complexity and psychological darkness to qualify as an emblematic British crime novel. “Station Eleven” is a superb dystopian novel, because it is first and foremost about people, not special effects. After a flu epidemic wipes out 99 percent of the world’s population within an astoundingly short period of time, the survivors must do hard and sometimes unspeakable things to survive. But this is not a book with graphic horrors. It is about psychological toughness, optimism, and the will to survive and endure. The book travels between events before the epidemic and going forward until twenty years after “the collapse.” There are two central characters: actor Arthur Leander, who dies within the first few pages of a heart attack while he is on stage, and child actor Kirsten Raymonde, who had a bit part in the same stage production. In a series of flashbacks, Arthur’s life is presented as a voyage between wives. As his renown grows, he becomes unmoored and trades his wives in with regularity. Has he ever cared about anyone, including the son he and his second wife produced? Arthur’s death occurs on the eve of the viral cataclysm. Kirsten is seven or eight years old at the time of the play. When we next see her it is twenty years after the epidemic. She is now a member of a traveling acting and musical troupe. By horse and wagon the thirty or so people in the troupe travel a circuit in the Midwest, presenting entertainment for the sparsely populated settlements in the area. Although the settlements are fairly stable and non-threatening, there are still dangers from brigands and beasts wandering the area. As the players enter one familiar town after a two-year absence, they look forward to reuniting with two former members they had left behind when their child was about to be born. Instead of their friends, they find a much sparser population and a reticence among the people who are there. Instead of a mayor, the town is ruled by a mysterious “prophet.” The troupe cannot leave town fast enough. Back on the road the players begin to suddenly and quietly disappear. Is it the prophet? Or something more sinister or supernatural? Emily St. John Mandel offers an interesting and thrilling book. Kirsten is a grown-up version of Katniss Everdeen — she’s smart and can hunt and kill — but she’s also close to the little girl she used to be. 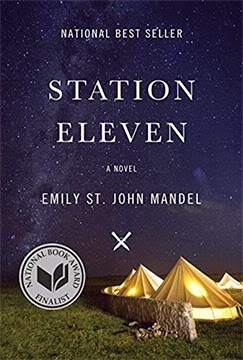 Arthur had given her a comic book, also named Station Eleven, on that last night, and she has treasured it as a connection to a world she barely remembers and as a imaginative depiction of other survivors in a fantasy world. Despite the hazards of the new world, there’s a freshness and renewal — in the air, in the night sky, in a sense of possibilities — that slowly had been driven out of the technology-obsessed world that fell that night twenty years ago. Mandel has created a book that is wonderful in so many ways. Not without reason, it was a finalist for the 2014 National Book Award in fiction. She didn’t win that award, but here is an MBTB star. 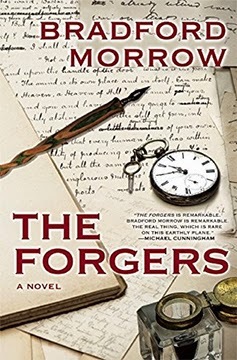 Nothing was strengthened in “The Forgers,” only sundered, for most of the book. Once, and only once, is the narrator named. It is among the interesting items hidden throughout the book. Actual rare book information and a fascinating tiptoe through the mind of a forger underpin Bradford Morrow’s erudite and entertaining morsel of a book. Surely it is contrary to the law of physics that this 258-page book seems twice as long, but not in a bad way. The narrator is a naughty boy. Despite being born with several advantages and educated more than adequately, he takes to forgery. Specializing in no more than a few authors, mostly in the late-19th century, the narrator forges their signatures, and sometimes writes in their manner. He is very, very good. After the narrator is driven to walk a straight and narrow path, he is plunged back into consideration of that proscribed vocation when his girlfriend’s brother is murdered. Meghan’s brother, Adam, too, is a collector of rare books. He is found amid a mess of ruined books, splattered with ink (forger’s ink? ), with both hands chopped off. The narrator would happily toddle off into the sunset with Meghan, with no further thought about the murder; there certainly was no love lost on his part over Adam. However, a stalker -- who also is a (gasp) forger -- proceeds to try to pin the murder on the narrator. The rather abrupt ending is the only thing that keeps this from an MBTB star. 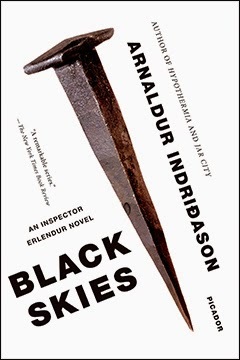 Arnaldur Indridason, the go-to Icelandic crime writer, published “Black Skies” in 2009 in Iceland, right in the midst of the economic meltdown of Iceland’s financial structure. Those were wild days when bankers and investors were hauling in the krónur until the three major banks failed when they couldn’t refinance their debt. In “Black Skies” the bubble hasn’t quite burst, but one of the storylines deals with the greed that put Iceland in a cold pickle. Indridason’s main character, Inspector Erlender, is strangely absent in this book. He is mentioned by colleagues and family in passing, wondering where he is and when he will be back. However, this gives Sigurdur Óli, Erlender’s conservative, rigid colleague, a shot at the limelight. Instead of being a one-note foil for Erlender, Sigurdur Óli takes a moral journey of his own, with the three cases highlighted in this book as his background. Sigurdur Óli is asked by a friend to “talk” to a couple who has been blackmailing the friend’s sister- and brother-in-law. What the heck, he decides, and drops by the couple’s home. The door is open and there is a dying woman in a ransacked front room. Sigurdur Óli barely misses being clobbered himself by the escaping marauder. Since he can’t easily explain what he was doing at the couple’s home, he hems and haws and attaches himself to the official investigation. When the woman dies, convinced they had nothing to do with her death, Sigurdur Óli tries to deflect blame from his friend’s family. He finds a suspicious connection between the woman and a hiking trip that ended in the death of one of the hikers. All the hikers are bankers and the more Sigurdur Óli digs, the more is uncovered, but maybe not necessarily having to do with the current murder victim. Sigurdur Óli is ending his relationship with his wife. He realizes, too late, that he was at fault. He traverses the complicated relationship between his mother and father, long divorced, and discovers several uncomfortable revelations about himself in the process. This is a chance very few secondary characters have: to have their lives fleshed out and given a sympathetic hearing. Sigurdur Óli makes the most of it. 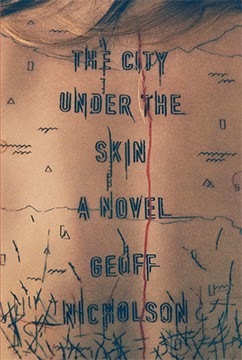 “The City Under the Skin” is a provocatively odd book. It’s both sweet and bizarre, creepy and tame. The only niche for Zak Webster is in a quiet store specializing in maps. He is a map nerd and nothing exciting happens to him except when his boss, Ray McKinley, drops by. Ray is an entrepreneur, land developer, and quick to find a buck. He is not a map guy but seems to understand more about the subject than his brash and assertive personality might initially indicate. He mostly leaves Zak alone, which suits Zak just fine. One day a woman comes to the map store. She is obviously homeless and disoriented. When she drops her velvet coat, Zak sees — aside from the fact that she is naked — a bunch of scribbles on her back, a chaotic tattoo. A passerby, Marilyn Driscoll, sees their encounter and also sees the tattoo. Suddenly a man in a Cadillac appears, whisks the woman away, then later returns to threaten and beat Zak (you have seen naw-zhing…naw-zhing). Billy Moore is the menacing man, and he has been hired by a sociopathic hitman, Wrobleski, to pick up women with similar tattoos on their backs. Wrobleski is also a map nerd but does not share Zak’s shy and awkward disposition. It appears that he would like to solve the mystery of what he presumes are maps on the women’s backs. Zak separately figures out that it was a map he saw tattooed on the homeless woman’s back. With Marilyn’s help, they toodle around town doing their amateur detective thing. Nobody ever thinks of calling the police, but Geoff Nicholson does hint at corruption in the government of the decaying, unnamed city where the characters live, so maybe they were worried about getting into hotter water. One of the best characters is Billy Moore’s 12-year-old daughter, Carla. She’s precocious and understands her father better than he would like to admit. She and her father live in separate trailers on the parking lot Billy owns. Billy is trying his best to convince the powers-that-be that he is qualified to take care of his daughter. As a result of trying to provide for her, he becomes embroiled in the escalating events engineered by Wrobleski. 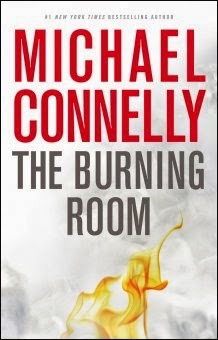 Although “The Burning Room” showcases Michael Connelly’s terse and compact style, the book weighs in at 400 pages. That’s because Connelly presents two full stories, both featuring Los Angeles cold case detective Harry Bosch and his new partner, Lucy Soto. A mariachi player was hit by a bullet twenty years ago and finally died from it. Twenty years ago the injury was attributed to a stray shot from a gang fight. When a postmortem dislodges the bullet, it is discovered that it came from a rifle, which tells Harry that it probably was not a gang-related shot. And, upon further investigation, Harry and Lucy conclude that the dead man was not the original target! After twenty years, exactly what clues possibly could be left? For the second story, Lucy reveals to Harry her traumatic childhood secret. She was a poor child who was in daycare in the basement of an apartment building when it caught on fire. The daycare provider and several children died, but Lucy survived. At the core of why she became a police officer is her determination to some day figure out who caused the fire. Was it drug-related, as was determined by the police twenty years ago? The perpetrator(s) was never found. Looking at the case material through fresh eyes, and with a certain amount of serendipity in both cases, provides Harry and Lucy with aha! moments. Skirting procedural correctness many times, Harry may be teaching Lucy some bad habits. Do as I say, not as I do, seems to be his lesson. The reasoning behind pairing an old-timer like Harry with a newcomer like Lucy didn’t quite have that method in mind. Although twenty years distance provides some insurmountable obstacles to finally solving the cases, Harry and Lucy lift the heavy weight necessary to provide satisfying conclusions. Connelly’s hypnotic storytelling and insider’s look at police procedures is also satisfying.